Officials at Rosecroft Raceway in Prince George’s County say the closed harness racing track may still have a chance to be reincarnated as a table games destination. When the track closed July 1, owner Cloverleaf Enterprises Inc. said it would convert from a Chapter 11 bankruptcy to a Chapter 7 bankruptcy and auction off the track. Potential buyer Mark Vogel also said the track was losing too much money for him to keep investing and that he could no longer afford the monthly mortgage payments. But now the Greenbelt-based developer says he is still making the track’s mortgage payments and is in talks with a few interested gaming partners and “in advanced discussions” with one. An antitrust suit against the Maryland thoroughbred industry filed by the bankrupt owner of a Prince George’s County harness racing track is still alive. A federal judge has ruled that Cloverleaf Enterprises Inc., which shuttered Rosecroft Raceway last month, has put forth enough evidence to allow the case to go forward. But U.S. District Judge Richard D. Bennett noted several times in his opinion that his ruling was based on whether Cloverleaf had enough of a claim to proceed. He noted it is rare to dismiss antitrust cases before the discovery stage. “An antitrust complaint should not be dismissed … ‘merely because the court doubts the plaintiff will ultimately prevail,’” Bennett wrote, citing a 1976 Supreme Court case against a private hospital in Raleigh, N.C.
Bennett’s opinion, issued last week, was in response to a motion to dismiss filed by defendants Maryland Jockey Club, the Maryland Thoroughbred Horsemen’s Association and others. In the wake of Rosecroft Raceway’s announcement that it will be closing July 1, supporters of the Fort Washington harness racing track are pointing fingers at Annapolis. “They talk about ‘jobs, jobs, jobs,’ and when the Preakness and Pimlico were in trouble, the governor and others ran downstairs to save them,” Sen. C. Anthony Muse, D-Prince George’s, said Wednesday, referring to swift legislative action last year that protected the property and the state’s first right of refusal to the race. “Here we have 200 jobs on the line and they have done absolutely nothing,” he said. Kelley Rogers, president of Cloverleaf Enterprises Inc., which owns the race track that declared bankruptcy a year ago, said it was no longer financially viable to keep Rosecroft open. ANNAPOLIS — After more than three days of closing arguments, the fate of a county-wide referendum on a slots casino next to the Arundel Mills mall is in a judge’s hands. At issue is the validity of 22,967 signatures certified by the Anne Arundel County Board of Elections out of 40,408 collected during the petition drive by led by opponents of the casino, including the Maryland Jockey Club. The casino would be built and operated by Baltimore developer David Cordish. PPE Casino Resorts Maryland LLC, a subsidiary of the Cordish Co., is suing the county board, challenging the process by which those signatures were verified. In his rebuttal closing argument Thursday in Anne Arundel County Circuit Court, PPE attorney Anthony Herman explained why the company believes the board should have abided by the stricter county code regarding requirements for referendums and petitions. ANNAPOLIS — Opponents of a slots casino planned near the Arundel Mills mall wrapped up their defense Wednesday in a hearing to decide whether the county elections board erred in approving their petition to put the development to a countywide vote this fall. In a continuation of closing arguments that began Friday afternoon, attorneys for the opponents (which include the Maryland Jockey Club) set out to rebut claims by the casino developer David Cordish that thousands of petition signatures should not have been validated by the Anne Arundel County Board of Elections this spring. PPE Casino Resorts Maryland LLC, a Cordish Cos. subsidiary, is suing the elections board in Anne Arundel County Circuit Court, challenging the process by which the 22,967 petition signatures of the 40,408 submitted by casino opponents were verified. ANNAPOLIS—A Cordish Cos. subsidiary began its exhaustive closing argument Thursday in Anne Arundel County Circuit Court in an effort to show that the county elections board erroneously approved a petition to put the company’s planned slots casino to a vote this fall. At issue are the 22,967 signatures validated by the Anne Arundel County Board of Elections out of 40,408 collected during the petition drive led by casino opponents, including the Maryland Jockey Club, this spring. The casino is to be located near the Arundel Mills mall and is planned by Baltimore developer David Cordish. Cordish subsidiary PPE Casino Resorts Maryland LLC is suing the county elections board, challenging the process by which the petition signatures were verified. Opponents of Baltimore developer David Cordish’s proposed slots casino at Arundel Mills mall claim they’ve found a connection between The Cordish Cos. and the people who they say disrupted their petition signature-gathering efforts this winter. In an affidavit filed in Anne Arundel County Circuit Court, a private investigator said a company affiliated with Cordish Cos. hired a woman to disrupt opponents’ eventually successful petition drive to put the casino’s slots zoning up to a county-wide vote this fall. An attorney for Cordish said his client denies the allegations. The affidavit was filed last Friday by the Annapolis law firm Rifkin, Livingston, Levitan & Silver LLC, which represents opponents of the casino including the citizens group Stop Slots at Arundel Mills and the Maryland Jockey Club. The latter operates Laurel and Pimlico race tracks. A savior for state’s racing industry? Penn National Gaming’s new stake in the Maryland racing scene could be a saving grace for the sport that’s been on the decline in this state for the last decade — but the deal’s impact will depend on whether the company can bring slots to Laurel Park. After more than a year of operating in bankruptcy, Magna Entertainment Corp. transferred the jockey club (which operates Laurel and Pimlico Race Course) to Ontario-based MI Developments Inc., its parent company. On Friday, MID announced a deal in which Penn National, known in the industry as one of the pioneers of race track casinos, would acquire an interest in the jockey club. MI Developments consultant Ed Hannah (left), CEO Dennis Mills (center) and Chief Financial Officer Rocco Liscio testify Thursday before the Maryland Racing Commission. The Maryland Racing Commission Thursday approved the transfer of Laurel and Pimlico race tracks to MI Developments Inc., whose CEO committed to bringing the businesses to a break-even status within two years. The approval was issued three days after a bankruptcy judge gave approval of Ontario-based Magna Entertainment Corp.’s reorganization plan that includes the transfer of five of its tracks and other assets to MID, its parent company, in exchange for the payment of debts and settlements. 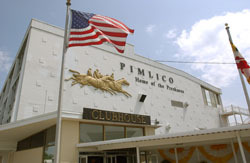 CEO Dennis Mills said after the commission meeting, which was held at the Pimlico Race Course clubhouse and overlooked preparations being made for the 135th Preakness Stakes, he hoped to bring the properties to financial solvency quickly. “Two years is the max, but we want to get [them] to break-even within months,” he said. WILMINGTON, Del. — A judge Monday approved Magna Entertainment Corp.’s reorganization plan, which includes the transfer of Maryland’s race tracks to parent company MI Developments Inc.
That means that by the time the Preakness Stakes is run on May 15, Pimlico Race Course will be under new ownership for the first time in nearly eight years. MID hopes to take ownership of five tracks, including Laurel Park and Pimlico in Maryland, by Friday night pending gaming licensing approval in Florida, according Magna attorney Brian Rosen. Rosen said after the Monday hearing in U.S. Bankruptcy Court in Delaware that Magna would agree to the language changes in the track’s confirmation plan outlined in Judge Mary F. Walrath’s ruling. “We’re all going to get it done,” said Rosen, when asked how fast Magna could work to get the necessary changes by the end of the week. If slots were to come to Laurel Park, prospective owner MI Developments Inc. would like to have Penn National Gaming operate the casino. WILMINGTON, Del. — Testimony during Thursday’s hearing to confirm Magna Entertainment Corp.’s reorganization plan for Maryland’s race tracks revealed more details on the company’s initial efforts to sell its assets and what could be in store for Laurel Park. If Magna’s plan to transfer assets to parent MI Developments Inc. is approved, the future could include Penn National Gaming operating slots at Laurel Park — if the track succeeds in obtaining a gaming license. “MI Developments has plans to have Penn National step in for the Maryland Jockey Club,” said Marc D. Puntis, managing director of investment banking firm Miller Buckfire & Co., which manages Magna assets. The jockey club operates Laurel Park, Pimlico Race Course and Bowie Training Center and is owned by Magna. MID is slated to take on a large percentage of Magna’s portfolio, including the Maryland properties, Golden Gate Fields and Santa Anita Park in California and Gulfstream Park in Florida. William B. Bayne, testifying on behalf of equity shareholders objecting to Magna’s plan, said that in his conversations with MID Chairman Frank Stronach, Penn National would be a majority interest holder in gaming. WILMINGTON, Del. — Tuesday’s hearing seeking approval for the sale of Laurel Park and Pimlico Race Course was marked by extensive testimony on the tracks’ financial details and their potential value with slots, as well as an assurance that the state would keep its right of first refusal to the Preakness . Ontario-based Magna Entertainment Corp., the bankrupt owner of the tracks, is seeking confirmation of its reorganization plan after canceling an auction to sell its Maryland properties last month. That plan includes the transfer ownership of five of its race tracks and other assets to parent company MI Developments Inc. in exchange for assuming unsecured debt and settlements. After hearing more than four hours of testimony in the U. S. Bankruptcy Court in Delaware from two company officials and a representative for the unsecured creditors committee, Judge Mary F. Walrath continued the hearing to Thursday morning. The Maryland Jockey Club spent nearly $660,000 in signature gathering efforts, legal fees and other services in its drive to place a referendum on the ballot this November allowing county voters to decide whether a slots casino near Arundel Mills should go forward. While the jockey club said it’s doing what it needs to do to help Laurel Park remain a player for slots in Anne Arundel County, others question the organization’s judgment in its spending. According to petition funding reports, nearly $400,000 of the jockey club’s money went to FieldWorks LLC, a Washington, D.C.-based firm the jockey club hired to assist in the signature-gathering process. The reports were filed with the Anne Arundel County Board of Elections and obtained by The Daily Record through the Maryland Public Information Act. The reports cover services and payments made from Jan. 31 through March 5. Approximately $190,000 was spent on legal services provided by three firms, with all but about $23,000 going to Rifkin, Livingston, Levitan & Silver LLC, the jockey club’s Annapolis-based law firm. “We live to fight another day,” said Sharon Roberts, executive director of Cloverleaf Standardbred Owners Association, the track owner’s parent company. In a lengthy hearing Tuesday afternoon at Pimlico Race Course, officials from Rosecroft’s owner, Cloverleaf Enterprises Inc., testified on the harness track’s financial viability. Cloverleaf President Kelly Rogers said with Vogel’s $350,000 loan and a $150,000 loan from the Cloverleaf Standardbred Owners Association, the track could remain operational through July 1. Both loans are subject to approval by a bankruptcy court judge. A bankruptcy judge has denied the proposed sale of Rosecroft Raceway to developer Mark Vogel, calling it a “sell out” that’s unfair to the track’s creditors and the harness racing industry. The track’s owners must instead sell Rosecroft through a traditional Chapter 11 reorganization plan. Meanwhile, Rosecroft owner Cloverleaf Enterprises Inc. notified its employees and shareholders Monday that if the track does not succeed with its legislative initiatives this session, which ends April 12, Rosecroft will close on April 19. Cloverleaf’s notice portrayed the sale to Vogel as an option for the track’s immediate survival that had been eliminated. While Vogel remains an interested buyer, the notice said legislation, which includes legalizing poker at the track, is the remaining course for keeping the track open. The sponsor of a bill that proposes reorganizing the Maryland Racing Commission is asking the governor to immediately remove the chairman of the state’s governing body for horse racing and launch an investigation into the commission’s conduct. Sen. Anthony C. Muse, D-Prince George’s, said that commission Chairman John Franzone has violated his term limit as by nearly a year, according to the Maryland Business Code, which allows two, consecutive one-year terms as chairman. Franzone was appointed chairman in 2007. Muse is also asking that Franzone be removed from the commission immediately. To obtain Pimlico Race Course and the rest of Magna’s Maryland assets, MI Developments will pay out about $114 million, including $89 million to settle a lawsuit filed by Magna’s unsecured creditors committee.Maryland’s race tracks have again been yanked off the auction block — this time because their owner has reached an agreement to sell them to its parent company. Ontario-based Magna Entertainment Corp. on Tuesday notified the six parties who were to bid on the properties, which include Pimlico Race Course and Laurel Park, that Thursday’s auction was canceled. Magna parent MI Developments will pay $89 million to settle a lawsuit filed by Magna’s unsecured creditors committee. That money will be used to pay general unsecured claims against Magna. MID also will pay about $13 million to cover secured claims of PNC Bank, about $6 million for holders of unsecured claims against the Maryland Jockey Club and $5 million to the former owners of Laurel Park and Pimlico. Opponents of a planned slots casino near Arundel Mills are striking back against a lawsuit filed by the developer that claims their work to fight his project was done illegally. Stop Slots at Arundel Mills, Citizens Against Slots at the Mall, the Maryland Jockey Club and FieldWorks LLC filed motions in Anne Arundel County Circuit Court Tuesday to intervene in the suit (PPE Casino Resorts Maryland LLC, et al. v. Anne Arundel County Board of Supervisors of Elections). A coalition formed to halt the state’s largest planned slots development near the Arundel Mills mall has succeeded in its campaign to let county voters decide whether to allow the casino to go forward. According to its Web site, the Anne Arundel County Board of Elections has validated more than the required 18,790 petition signatures to get the measure on the ballot this November. Voters will now decide whether the County Council should have allowed zoning for the slots site planned by Baltimore developer David Cordish. As of Thursday, 19,054 signatures have been accepted. Several thousand more signatures are still being processed by the election board. Rob Annicelli, president of the citizens group Stop Slots at Arundel Mills, called the referendum a “daunting task,” but said in a statement he expects several thousand more signatures to be validated by the board. When the parent of Maryland’s thoroughbred racetracks filed for bankruptcy and announced it would sell its Maryland properties, it sent a wave of uncertainty, fear and frustration though the state’s horse racing community. Exactly one year later, some say it’s gotten messier. Since it filed for bankruptcy on March 5, 2009, Ontario-based Magna Entertainment Corp. placed Laurel Park, Pimlico Race Course and Bowie Training Center on the auction block, took them off last spring, then put them up back up for auction again last fall. The company has delayed its Maryland assets auction three times in the last two months, with the latest reschedule — March 25 — adding to the feeling of instability. It’s been a hand-wringing wait for those on the sidelines.